I’m just as surprised as you are about these new cute baby bedding sets from Wal-Mart. They are quite cute and stylish. …. and.. only $79.97 for a 4-piece set. Crazy. 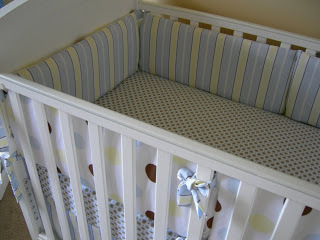 I wish this print was around when I sewed my own baby bedding from House, Inc. Fabric to avoid paying $350 just for the 3 piece set. 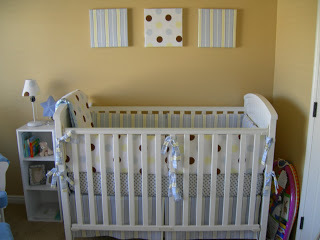 Wow, that is super cute–and the mod crib and dresser set is also super stylin’ for Wal-Mart! I never would have expected it! Wal-Mart gives me the heebie-jeebies but I still go there occasionally–their potted plants are really cheap, for example, and among the predictably ugly baby clothes there are some really cute and very cheap finds. I still won’t shop at Walmart, but the crib bedding you made is incredible. You are a wonderful seamstress! So cute! wal-mart huh? never would have guessed. but how’s the quality? it looks great in the pictures, but up close? and will it last? yours on the other hand… totally incredibly i can’t believe you made that! Can I pay you to make somthing like this for me? How did you just do this??? Did you get a pattern? You are unbelievable!!!! Jade… you are too funny.. I didn’t have a patterned.. I just made up my own measurements. I looked for a patterned at JoAnn’s but I couldn’t find one I liked, so I improvised. wow! you are really giving me a complex… no I’m kidding… I really love your website and ideas… I have used some.